Made for $500,000 which would barely cover the catering bill for Transformers 3, this is an undiscovered treat from writer/director Gareth Edwards. 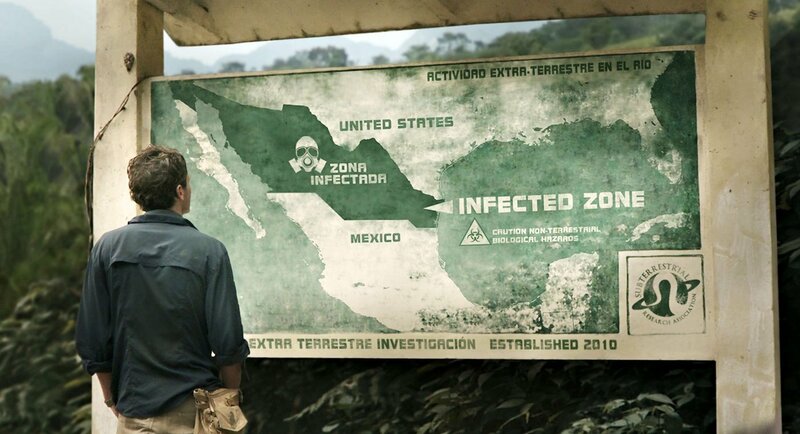 The film establishes that following the crash landing of a deep space probe, extra terrestrials have landed and taken up residence on earth causing a massive “Infected Zone” between the USA and Mexico. Walls are built to keep the creatures out of the US and regular bombing runs are conducted, to kill the Octopus like aliens. The spraying of poison is also widespread, to wipe out the growing tree borne infection. The film follows Sam Wyndem (Whitney Able) and photographer Andrew Caulder (Scoot McNairey) as they try to find their way home. Sam is the engaged rich daughter of the newspaper owner for whom Andrew works, he is reluctantly tasked with bringing her home safely around the “Infected Zone”. The film is everything that a modern blockbuster is not. Thoughtful, poetic, full of languid looks and periods of silence. The effects are low key but highly effective when used, in a Jurassic Park kind of way. Clearly the crew had plenty of Extra Terrestrial street signs which prove very handy in establishing the story as the film progresses. The journey home should be simple but due to various circumstances, the couple find themselves increasingly reliant upon each other to get through. The fact that neither actor is well known, adds to the “what will happen to them” feeling and they bring no previous audience career baggage to the roles. Both act well and bring a freshness to the film as these are new actors to most audiences. The chemistry between the “couple” is very evident. Sam, dressed in a Lara Croft type outfit throughout and together with her obvious cuteness, is not unpleasant to watch. However, the relationship between the pair is anything but your normal Hollywood stereotype, relying instead on nuance and believable characterization. This causes you to truly care about the characters and even those they meet briefly on their journey. Filmed on a shoestring budget with two crew and off the shelf cameras, often without permission and using whoever happened to be in the location at the time. This is guerrilla film making at it’s finest and a testament to what can be achieved with relatively low priced equipment and software in 2010. Edwards wisely keeps his monsters at a distance and under wraps for lengthy periods, when they are in plain sight, they prove to be reasonably believable and menacing. More character piece or even strange love story, than out and out actionfest, there is time for creative cinematography in amongst the action. Characters faces are well lit, locals are brilliantly captured with the subtext of “are they happier where they are”, despite the ever present danger hiding in the jungle. There appears to be a political subtext if you care to look. The heavy handed US military, apparently causing more harm than good. The bunker mentality, walling off all the nastiness whilst establishing an ever diminishing “protected zone”. The possible analogy with the current real world border discussions are alluded to on more than one occasion, whether intentionally or not. Not as commercial as District 9 but certainly more intelligent than the Transformers movies, this is an undiscovered gem that will repay viewers who are able to hunt down a copy. Some may find the pace a little slow, after all not that much happens but this is entirely in keeping with the mood and tone of the film. The ending may be a little mystical for some but overall this ties together the films short running time neatly enough. An intriguing premise executed well, this makes for a very different watch from your usual blockbuster fare. Defying easy pigeonholing, this might be “District 9”, crossed with “Jurassic park” and “Apocalypse now”. Whatever it is, it comes highly recommended.